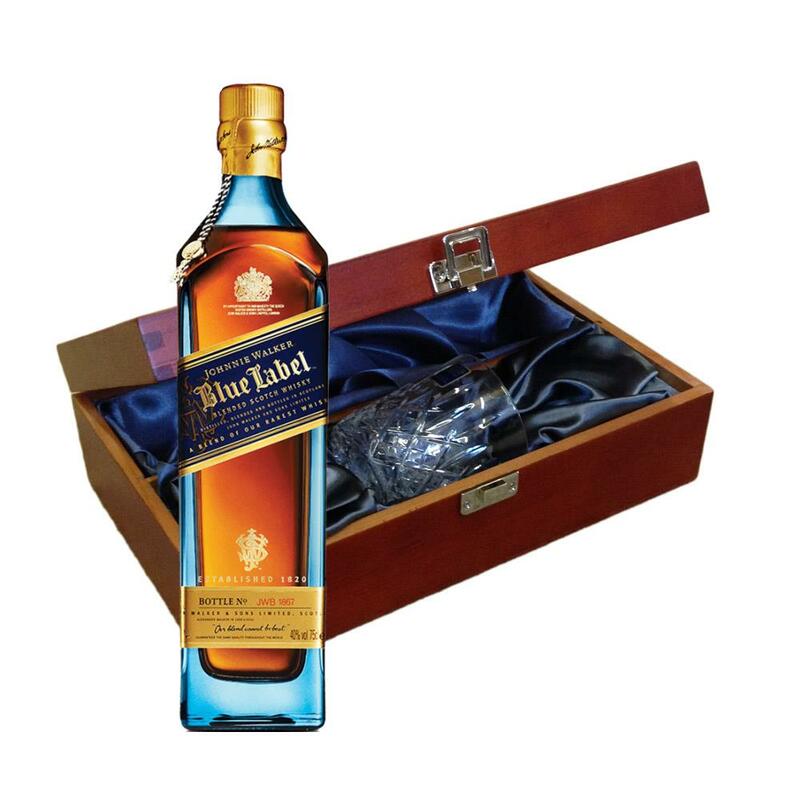 Send a bottle of Johnnie Walker Blue Label 70cl wine in a lovely box beautifully stained featuring traditional joins with hinged lid and clasp fastening. Along with a beautiful hand cut lead crystal Royal Scot glass. All gifts come with a gift card with a message of your choice. Johnnie Walker Blue Label -Johnnie Walkerandamp;apos;s most prestigious whisky. Probably the most famous super-premium blend made up of the finest old-aged malt and grain whiskies. Johnnie Walker Blue Label is made from a few exceptional whiskies with powerful flavours. Each bottle is precious to us and is individually numbered. Each contains a rare taste and gives an intense experience. Johnnie Walker Blue Label is the ultimate luxury Scotch Whisky and supplies of Blue Label are limited by the rarity and expense of the whiskies used in the blend. This product is hand packed onsite by Gifts International, and is not affiliated with any other brand. Gifts International is responsible for this product combination/set.